In addition to being the Feast of St Cecilia, patron of musicians, today marks the 100th anniversary of the birth of composer Benjamin Britten. 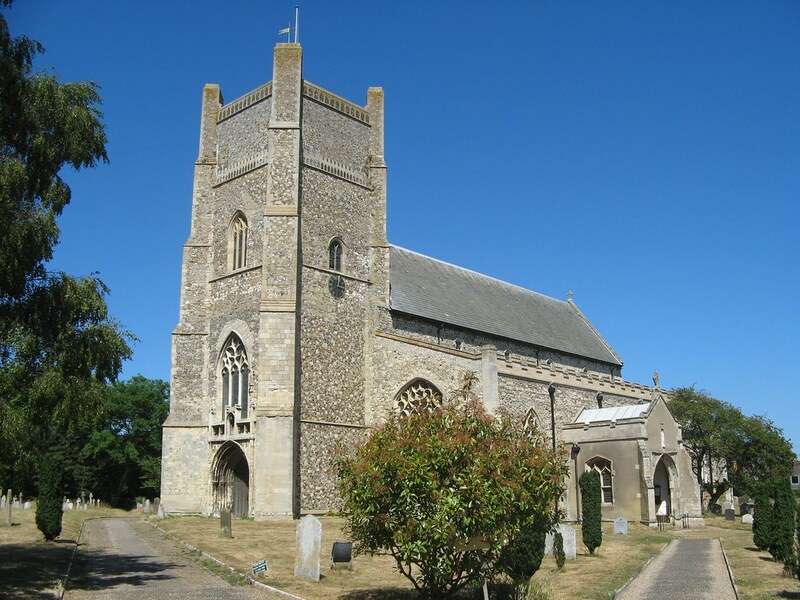 He was a kindred spirit to many of the delightfully complex turn-of-the-century Anglicans (and Britons generally) dear to the heart of this blog. So here is a brief celebration of someone whose work provides an incredible example of whole-heartedly engaging tradition in the creation of new works for the church. One such work was the opera Noye's Fludde. This work was written specifically to be performed in a church—with the attendant architectural and social implications thereof—and combined parts designated for professional performers, amateurs (mostly children), and the congregation/audience. Noye's Fludde went on to be staged by many churches and community groups. It also played a central role in Wes Anderson's Moonrise Kingdom. 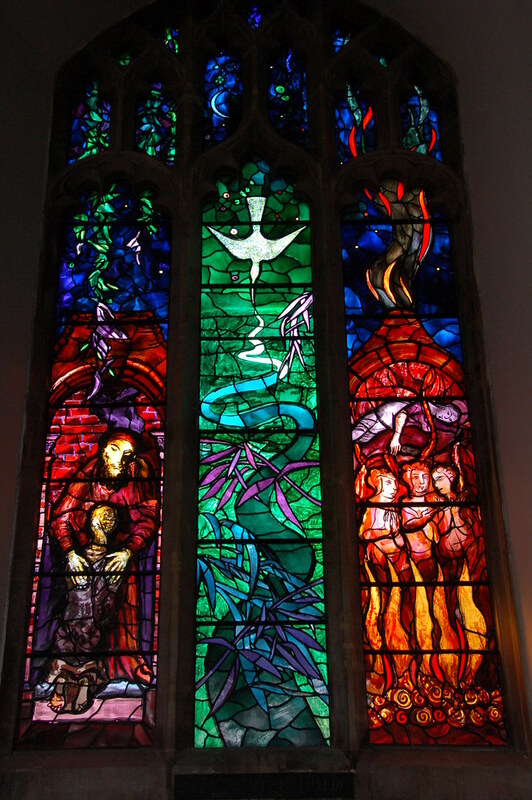 A memorial window at SS Peter and Paul, Aldeburgh, where Britten is buried, depicts Britten's three "Parables for church performance": Curlew River, Op. 71 (1964); The Burning Fiery Furnace, Op. 77 (1966); and The Prodigal Son, Op. 81 (1968). The parables were based in part on the "stylized ritual of Japanese Noh theatre" (source). There is an obvious influence in the deliberate sparsity of the music's structure. 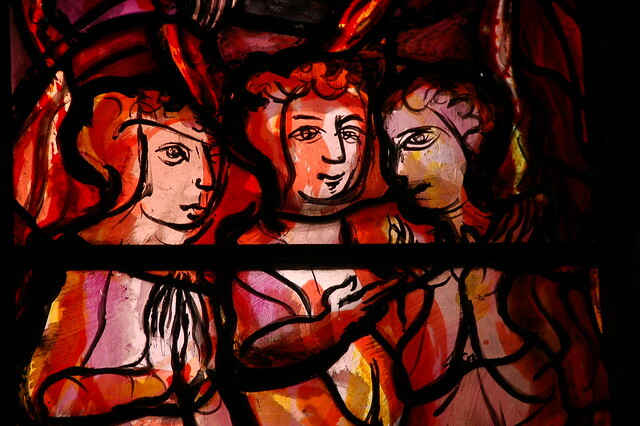 In much of Britten's music I hear an intentionality proper to ritual (across divers cultures) combined with an engaged earnestness (thinking of the amateur performers in Noye's Fludde or his folk song setttings). What would be the architectural analog? Perhaps the brick churches of Edward Maufe or the later works of Sir Giles Gilbert Scott, at least as countrymen of similar time. But I think there are illustrations of sound architectural principles in this music that I hope to explore further.